EverPower Renewables' first wind farm-built on the site of an old coal strip mine in Pennsylvania-is a success due in part to comprehensive preparation work on the part of the company. Wind farms seem to be springing up all over, but talk to a project manager and you'll find that most of those projects required years of preparation before breaking ground. This was the case with Pennsylvania's Cambria county wind farm-the Highland Wind Project-that was constructed on the site of an old strip mine. The $140 million project includes 25 wind turbines generating 62.5 megawatts, enough power to meet the needs of 20,000 homes. For years, the rich coal reserves in Cambria County helped power Pennsylvania and the nation. Today, wind is replacing the smoke stacks and strip mines. The state's Alternative Energy Portfolio Standards Act requires that 18 percent of all energy generated in the state come from alternative and renewable sources by 2021. Approximately 3,000 to 4,000 megawatts of wind capacity is expected to be installed in the state by 2021. In 2009, Pennsylvania expects to add 298 megawatts of wind energy capacity to its existing 293 megawatts. Michael Speerschneider, director of development for EverPower Renewables, says that the Highland Wind project began, like all wind farm projects, with finding a desirable location. The company was looking in Pennsylvania for a spot with high elevation and relatively flat terrain. "The strip mine had those features, but it was also a bit less developed than some other areas and presented a good opportunity for a project like this," says Speerschneider. The next step was to begin work with government agencies and townships to ensure that the construction would be correctly permitted and supported by the community. "We started the development phase in 2005," says Speerschneider. "The process took approximately three years, but that time frame is fairly commonplace." From the start, EverPower took steps to ensure the development was handled correctly-from working with the resource and state agencies, down to the county and township level. "We were able to maintain a presence in the community. The regulators and the townships and the county knew who we were and what we did," Speerschneider says. "We made a strong effort to engage the people, work with them, and share our plans with them." One of the goals for Speerschneider and his team was to ensure people weren't confused or wondering what was going to happen next on the project. "We tried to educate people on what the realities were-everything from what the contract would contain to what the turbines would look like. We also talked about the economic benefits and what it would mean to the area." In addition, EverPower's people made themselves available. They let area residents know how to contact someone if questions arose. "I think that has really been helpful, and it's the right way to develop projects," says Speerschneider. EverPower didn't run into any permitting problems, but again, that's because of its extensive development process. "We were able to work pretty closely with some of the agencies-like Pennsylvania's DEP (Department of Environmental Protection) and the Pennsylvania Game Commission (PGC). "The PGC has protocols that they put in place that we worked to implement," says Speerschneider. "For example, they have pre-construction surveys, which we conducted. This included a whole series of things, such as counting birds and searching for different species of concern that may be in the area. In this case, we didn't find anything in those surveys." 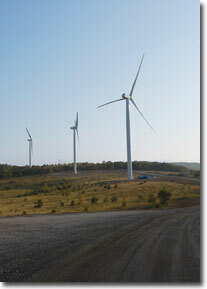 Construction of the Highland Wind project in Pennsylvania began in April 2008, and commercial operation began this past August. The project brought an estimated $150 million in capital expenditures to the area. EverPower continues to work with the Game Commission-now conducting post-construction surveys. "We're doing daily tracking of the mortalities that we have with the birds and the bats. People search under the turbines five times a week, just to make sure that we're not having a greater impact than what we expected we would. We expected a minimal impact, and that's what we're seeing so far." Construction began in April 2008, and commercial operation began this past August. Although the 25-turbine wind farm is one of the largest in Pennsylvania, it isn't considered larger than average. "The trend is towards sort of bigger projects, more turbines in the projects. And that's primarily a question of economies of scale-being able to take advantage of the larger power production," says Speerschneider. Like the other projects EverPower is currently developing, the wind farm is an IPP (independent power producer). "We sell the power wholesale to the grid. On this project, there's an existing transmission line that goes right through the project, and we just basically connect into that and are selling it wholesale. We do that over a 22-year contract," Speerschneider says. "In this case, we are selling power to First Energy." Because the Cambria County wind farm was constructed on an abandoned strip mine, some engineering expertise was required. Some of the technical challenges included creating proper foundations and structures for the massive turbines, but it was nothing that delayed the project. 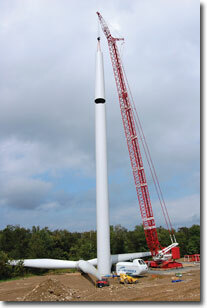 EverPower used Nordex N90 2.5 MW turbines for the project. "We selected Nordex and these turbines after extensive study of their success in European installations," said Jim Spencer, CEO of EverPower. "While new to the U.S., Nordex's 2.5 MW product family is widely used in Europe with more than 1,000 units installed. "The 2.5 MW turbine allows us to achieve a higher power density in the land-constrained areas in the Northeast, where we have a large development pipeline." Speerschneider adds, "It was the right machine at the right time, and we were really happy with that. 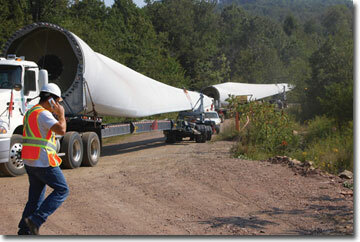 Physically, the size of the turbine is no bigger than others. It produces more energy, but it's not apreciably bigger than anything else that is out there in nearby Summerset County or Cambria County." Between the time the project began development and it started commercial operation, the U.S. went through a serious financial crisis. It didn't stop the Highland project, but many renewable energy companies, including EverPower, are feeling the effects. "The economic downturn changes things in all different ways," says Speerschneider. "Certainly, this is a very capital-intensive industry-to the extent that there was some liquidity removed from the market, which made things a little more difficult on the financing side." On the other side of the coin, turbine prices have gone down worldwide over the last six months to a year. "A lot of that goes into the financial modeling of these projects. The cost of the turbine is a big part of it. Some of the other financial terms have tightened up a bit more, so that may offset it a little." In short, Speerschneider says the market upheaval has changed the way deals are structured for the foreseeable future. "But we're dealing with it and going forward positively." He adds that wind and other forms of renewable energy still remain one of the best investments in the world. "The financing never completely went away, but certainly things have changed. There will be different financing structures and different criteria that will be applied now versus before. But particularly for this project, it didn't slow things up too much. We still had access to the capital we needed to get it done." EverPower has reason to be positive. Recently the company received private venture money-$350 million to be exact. "It will allow us to continue to expand our development pipeline and keep things moving," he says. For Speerschneider, one of the project highlights was that this was EverPower's first project. "Not that building any project wouldn't be exciting, but it's been a good experience with the team we have and the work that we've put in to get this done. It's very gratifying and satisfying to have an operating project now." Speerschneider is also proud of the positive presence the turbines have in the community, as well as the economic boom it brought to the area. "We don't have a formal economic analysis yet, but at peak construction, we hired over 150 construction workers. We have now, I believe, seven full-time employees working in the operations and maintenance crews for the project. So that's pretty significant for the area-good paying, long term jobs." Projects like this also have an indirect effect. "This project brought $150 million to the area in capital expenditures, and just the activity that gets spurred by that trickles down to the economy," says Speerschneider. "For example, right up the road in Ebensburg, Pennsylvania, there's a Gamesa plant that manufactures the rotors. They didn't directly feed into our project, but it's the jobs and other things going on to support the wind industry and it grows throughout the region and throughout the country." Although the wind farm has only been up since August, all seems to be going smoothly. The operations team likes the turbines, and the wind farm is operating well. The township can be proud of 60+ megawatts of power being produced free of emissions, preventing 400 million pounds of carbon dioxide from reaching the atmosphere-according to EverPower's calculation-the equivalent of taking 19,000 cars per year off the road. Not bad for a strip mine turned wind farm.